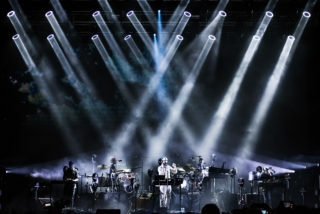 If you’re best known for being That Guy Who Made The Acoustic Break-Up Album In A Cabin In The Woods, it takes a certain level of obstinate artistry to headline a major festival with an ensemble comprising two drummers, three sets of throbbing electronics and a saxophone quintet. And if you’re best known for the kind of anthemic torch songs that soundtrack wedding videos, then it requires a particular bloody-mindedness to dedicate the first two thirds of that performance to an album that appears precision engineered to alienate the passing fan, with songs slathered in dissonant autotune and obfuscated by obscure numerology, glitch and texture taking precedence over conventional ideas of soulfulness. 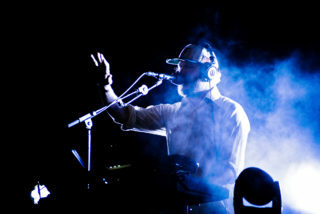 Yet that’s how Justin Vernon decides to play Bon Iver’s headline set on the first night of Primavera, and like last year’s ‘22, A Million’, both his undeniable melodies and extraordinarily powerful falsetto (tonight resembling Prince in his prime) provide at first a way through all the surrounding auditory thorns, and then eventually a glue that joins them together into an almighty demonstration of how to communicate complex musical ideas to a huge crowd. Part of that is due to the production – a dramatic light show that frequently simulates an electrical storm punctures intriguing, serpentine visuals – but the real lynchpin is Vernon’s musical vision: he introduces the bruised ‘29 #Strafford APTS’ as “stoner country music” and adapts the original version accordingly, and his warm, dense saxophone arrangements, while perhaps rather testing on paper, perfectly suit the balmy Mediterranean evening. 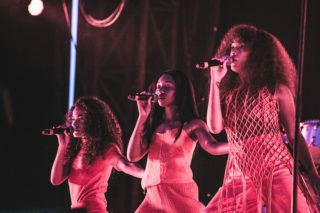 The repeated blasts of sub-bass and electronic gurgles, too, hint that this is a gig desperate to become a rave, teasing a sort of communal euphoria among the melancholy. 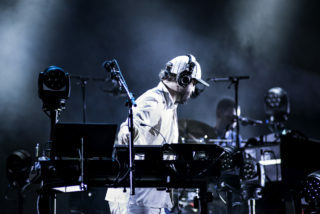 Eventually, songs from Bon Iver’s earlier albums appear, and the familiarity of ‘Perth’, ‘Holocene’ and ‘Creature Fear’ are gratefully lapped up even if, in the context of the previous hour, they feel like concessions to a Big Festival Headline Show formula that is no longer particularly valid. Thankfully, though, that lack of legitimacy doesn’t apply to the one-song encore, which Vernon performs alone, on a stool under a single spotlight, with that same resonator guitar he took to his cabin in the woods 10 years ago. ‘Skinny Love’ is almost bigger than Bon Iver these days, and yet here Vernon reclaims it with the kind of spirit, urgency and verve that every twee cover version of it omits. Its raw romanticism is dazzling, the accompanying crowd singalong a joy, and it’s the finest moment that this year’s Primavera will witness. On the release of ‘22, A Million’, Vernon confessed to debilitating anxiety and panic attacks that have affected his day-to-day life, something that reached a head when he cancelled his tour earlier this year citing personal difficulties. 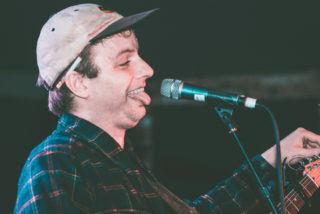 Those troubles are visible in every grimace Vernon makes tonight – by no metric is he a comfortable, outgoing performer, and this performance is clearly a trial for him. 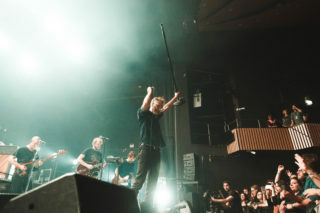 However despite that, or perhaps because of it, the gig goes beyond just a musician playing songs, elevating itself to become a 20,000-strong therapy session, a mass exorcising of demons, 90 minutes of concentrated catharsis.